As readers of this blog may have gathered, many are the actual theatrical productions in which I've taken part. Actor, director, playwright, stage manager, costume designer, sound/lights operator, usher, etc. 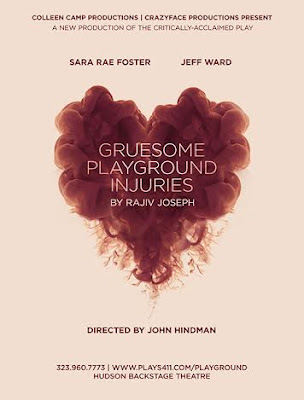 I mention this not to toot my own horn (well, not only that...) but as a segue to a problem with the script of the Gruesome Playground Injuries by Rajiv Joseph. Technical, not artistic. Let me make this excessively clear -- I mention this as a means of praising the production. You'll understand in a moment. Essentially, the play deals with two people -- Kayleen (Sara Rae Foster) and Doug (Jeff Ward). They meet as children (in a playground) and we see the course of their relationship over the next three decades. Herein lies the first technical problem. Given everyone has to make costume and makeup changes between each scene, the action most likely would simply stop between scenes. Frankly such a problem plagues a lot of otherwise very good shows. But -- the action didn't stop! We never 'left' the emotional lives of Kayleen and Doug. Partially this lies in the playwright's lovely choice of not strictly sticking to linear time. Yeah, the first scene chronologically comes first and the very last scene does happen last, but other wise we jump around with them. That helps make it feel more real, because it feels like memories. Technically the production helped out by filling the moments in between. Designers (Dustin Reno, Chris Moscatiello, J.R. Brude, Leigh Allen and A. Jeffery Sheonberg) gave us a simple set, easily shifted to lots of different locations. More, projections on screens of images (with music) invoked a sense of time's passage, without actually becoming referential at all. No small trick! Initially I found myself thinking the pictures and footage shared should have had more to do with the plot, but that reaction soon evaporated totally. I sank into the feel, the ebb and flow given. Plus the actors never left stage! They simply stepped upstage into the less-lit areas and changed clothes, maintaining an emotional connection, carrying we the viewers to the next scene! And the result! Gruesome Playground Injuries frankly is a subtle work, almost a dramatic poem about these two people who find each other. Help each other. Love each other, perhaps in a romantic way but always as deep devoted friends. Never having to start up the action once more allowed the cast (and director John Hindman) to keep the delicacy of it. Kayleen and Doug, as the title suggests, suffer injuries. Most of Doug's are on his body, one way or another. Most of Kayleen's end up on her soul. Mostly. For both of them. At times it seems creepy, or tragic. Other times the whole thing seems funny ("Struck by LIGHTNING?"). But from the very most basic start, when the two are just children at Catholic School, we sense the connection. We may not understand it. They almost certainly do not. But these two actors show it, breathe it, live it for those ninety minutes. Childhood to middle age. Optimism to despair and back again. Fearlessness and desperate endurance, rage and gratitude, denial as well as terrified truth-telling. It hurt to watch. And felt wonderful. More, I at least could not look away. So you might want to take my following words with a couple of grains of salt. Or not. I'm pretty opinionated. 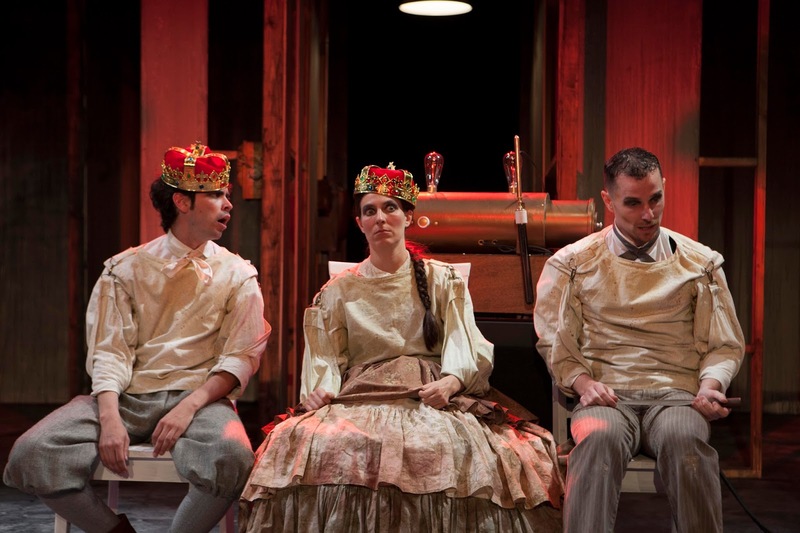 Anyway, Zombie Joe's usually does one Shakespeare (or other classic) per year and for 2016 Denise Devin directed As You Like It, the most "pastoral" of the Bard's plays. For those who don't have a degree in theatre, that means the play is all about celebrating how lovely and honest nature can be, apart from the terrible things happening in society and politics and the like. Wrapped up with lots of love stories. A green rom-com in other words. 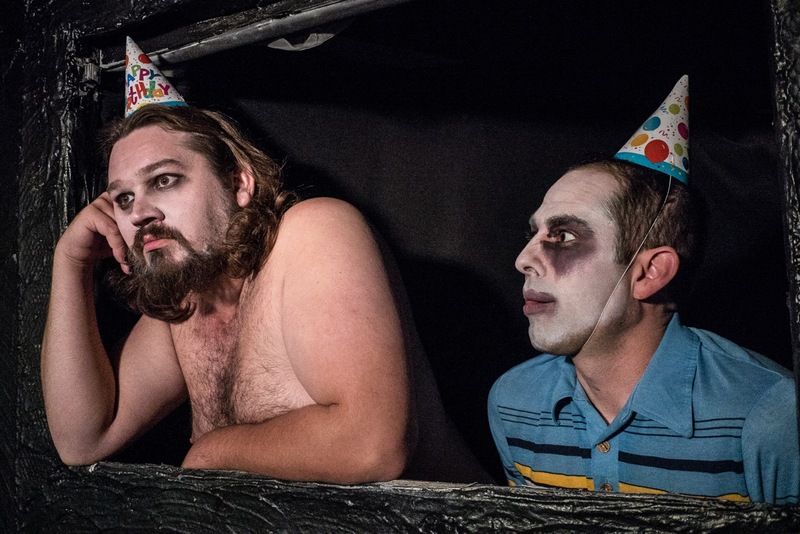 Like A Midsummer Night's Dream the show proves a frenzy of mistaken identities and misunderstandings, although in this case lacking anything like magic or fairies or ghosts. Instead we get a world of feuding brothers. 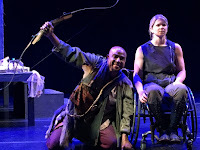 The Duke (Roger K. Weiss) who loses his position to his brother Frederick (Rick Berraras), fleeing to the Forest of Arden with his followers, most especially the eternally witty Jacques (Jonica Patella). Central to the whole plot are another pair of rival brothers, the mean jealous Oliver (Zack Zoda) who neglects/hates his younger sibling Orlando (Alexander Jon), refusing to give up the lad's share of their father's estate. In desperation, Orlando agrees to take part in a challenge of some great wrestler, and wins -- right in front of the admiring eyes of our heroine Rosalind (Micheala Slezak). Okay, please pay attention to this next bit. Rosalind is the daughter of the banished Duke, and bosom companion of Duke Frederick's daughter Celia (Heather McConnell). Nasty Frederick dislikes Orlando because of his father, so warns him to go away -- without his winnings of course. And then Frederick banishes his niece Rosalind on pain of death! But Celia will not be parted from Rosalind so the two of them change their clothes--Rosaline dressing up like a man named "Ganymede)--and along with their favorite jester Touchstone (Jason Britt) head for the Forest of Arden. They in fact do not know Orlando and his elderly family servant Adam (Patrick Beckstead) have likewise high-tailed it to the very same woods! Once there, other than Touchstone falling in love with a sphepherdess named Audrey (Elif Savas), we have the merry mixup of having Orlando -- who fell in love with Rosalind instantly and hard, just as she did with him -- meeting this lad "Ganymede." Meanwhile another shepherdess named Phebe (Monet Hendricks) has taken one look at "Ganymede" and fallen in love with "him." And shenanigans are to be had! Honestly there's a more melancholy nuance to the play, but in order to fit into a single hour, Devin focused -- understandably and quite successfully -- on the romp. As a result, we get an extremely entertaining romantic comedy with all of Shakespeare's (many) tricks in that regard. You the audience are meant to smile, to hope for a happy ending for all these silly nice people. We do. And we get it. Sometimes with startling twists. Lacking a frantic pace, this play and production is more like a delightful picnic instead of a fireworks display. But who does not like a delightful picnic, complete with games and wit and laughter? 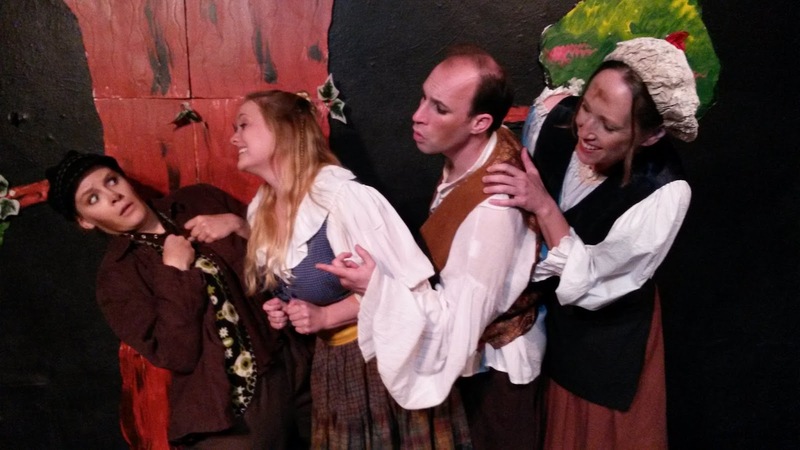 As You Like It plays Fridays at 8:30pm and Sundays at 7pm until June 19, 2016 at ZJU, 4850 Lankershim Blvd (just south of the NoHo sign), North Hollywood, CA 91601. I really believe there's something in the air. Within the last two years at least four productions of Shakespeare's tragedy about the Moor of Venice have seen production in LA to my knowledge, with at least one other play about a man playing Othello. 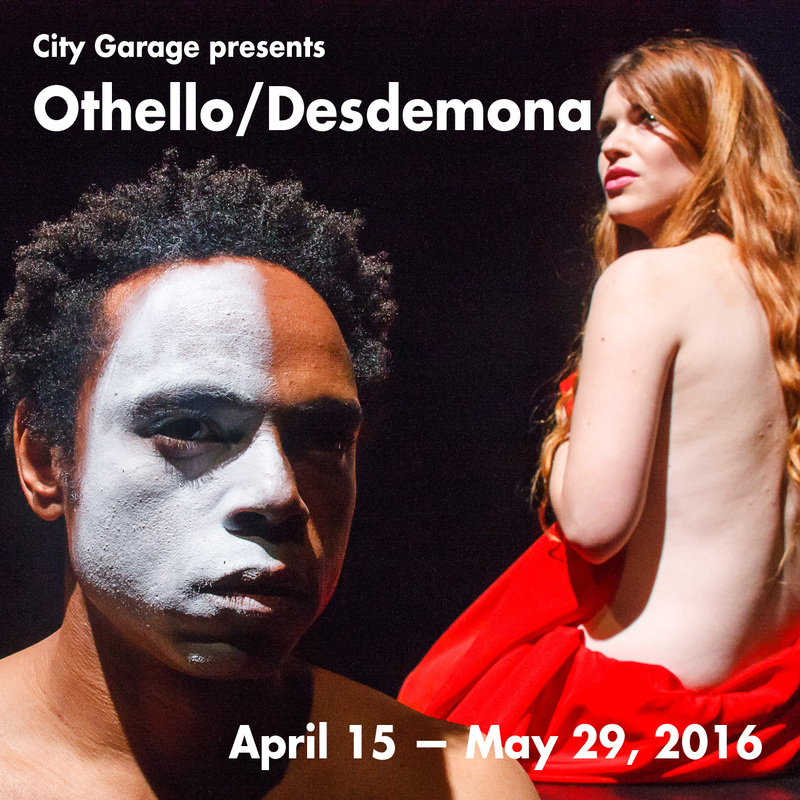 Now in City Garage's production, titled Othello/Desdemona, the play is deconstructed along a variety of directions. It should make for a fairly dull, intellectual exercise. What we get instead is much more like an ancient Greek tragedy through a very modern lens -- people talking about issues, about ideas, and what they say changes lives. Their lives. Charles A. Duncombe does not simply edit Othello but rather uses it as a seed. It literally begins with the image which frankly elicits so much shock from characters -- and, let us admit, audience members. Othello, very much Black (in theory he could be Turkish, or in some sense Arabic), in bed making love to his pale white bride. Then, the climactic murder scene, with Othello (RJ Jones) beginning some of the regretful lines of the Bard, only to shift abruptly into modern speech. 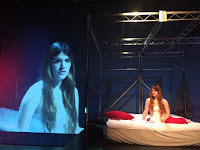 Desdemona (Kenzie Kilroy) pushes the pillow off her face and tries to chat with her husband. As a segue between the modern and the classic, we get a glance at what this couple might have been in our own time. No so surprising to find Desdemona bored with Cyprus, eager to find a way to express her own individuality, frustrated at her husband's lack of response. He knows things -- history, archeology, the like. But he is a soldier, an honorable profession he claims. That he himself feels as frustrated as she eventually emerges. This altered context allows directer Frederique Michel and the entire cast (as well as the design--Duncombe again) a dazzling exploration of the familiar story. 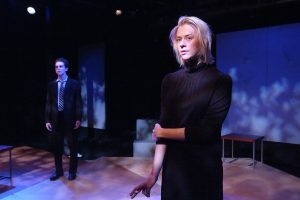 A series of conversations replace the convoluted plot of the original, focusing instead on the tensions and ideas between a mere five characters. Iago (Andrew Loviska) for example notes Othello's assumption of a White identity, playing Devil's (or really Angel's) Advocate for recognizing racial injustice. In fact, Othello wants more. He longs to leave the military and enter the government of Venice -- a seat on the Council. To win that, he literally dons white face and spouts right wing excuses for ignoring racism. After all, he wants to get ahead. To be more, as does Desdemona. But, tellingly, as immature and whiny as she sometimes seems, she immediately dislikes her husband giving up his identity just because he has a meeting the Doge (Bo Roberts). All of which could come across as very academic, especially the dialogue about specific issues. Yet all of this remains dramatic. People want things, fear never getting them. Their emotional lives spill over and begin to get us--the audience--wet. Metaphorically. So in Othello/Desdemona, the countdown to tragedy actually feels tragic. We know after all this play might end differently. 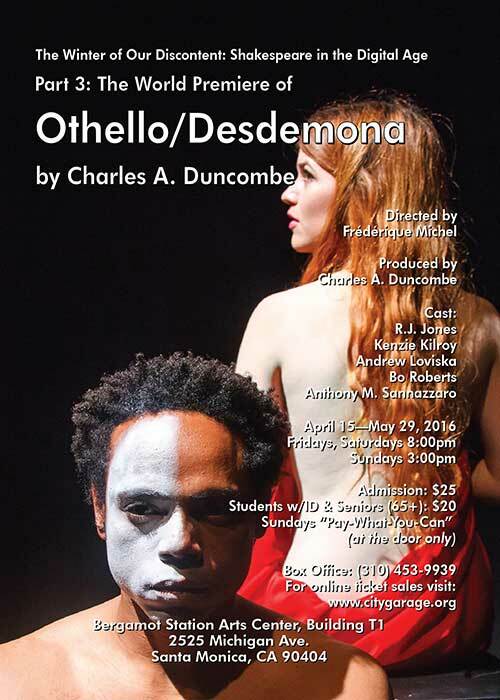 Perhaps this time, Othello won't do it, won't murder his Love. Shakespeare wrote that story, but this isn't his story. Or is it? Aren't the same forces at work today as then? Not merely the weird fetishizing of the Alien Other, the glass ceiling of ambition, the impatience of those in power, but also the same rules of what Love is supposed to be? Rules all but impossible to follow? 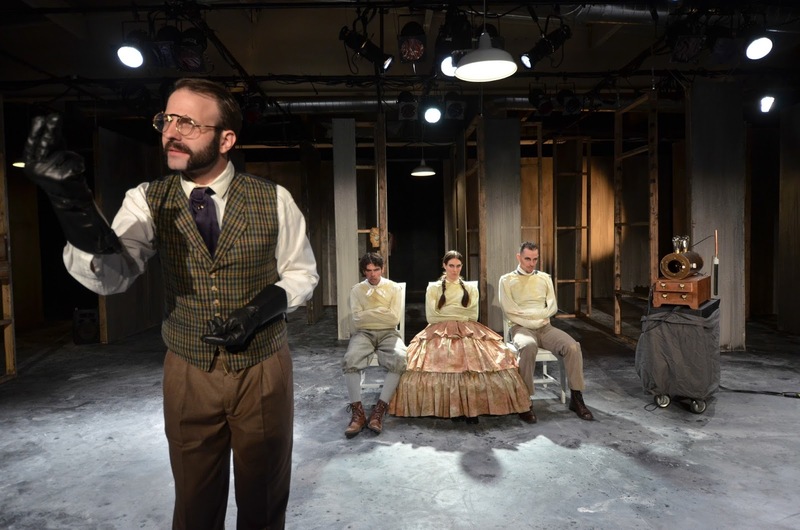 At the end, as the title characters relive the climax of The Play (if not this play), Iago and his wife Emelia (Anthony M. Sannazzaro) describe events -- not merely actions and words but emotions, revelations, fears and hopes. To her of course this is also a story of their love--Iago and Emilia. So her chronicle tells of what was almost perfect, ruined by a flaw that need not exist at all. Her words of an alternate kind of Love, that desires just happiness for the beloved, first and foremost just that, ached with long sadness. Just as his description of what leads to murder brims with a frantic glee. Almost pornographic. When this play ends, we get a startlingly wide spectrum of understanding not of the events but why, and how those involved feel. It makes for a different kind of excitement -- that of a mystery solved, a poem finally understood, an insight into fellow human creatures attained. Due to scheduling problems, I did not see this work until it had but one more performance scheduled. This frustrates me so much, because to share wondrous experiences is a major reason for writing these reviews. The Superhero and His Charming Wife certainly qualifies! Not merely because the physicality of the production proved amazing (although it certainly was). Given the genre it explores, that of superheroes, small wonder so many scenes dealt with deliciously staged combat. Hero (Jones Welsh) in particular did a series of wonderful dance/combats throughout, nearly all with women not coincidentally. Including, yes, his charming wife Julie (Joanna Bateman). What most impressed me about this play written and directed by Aaron Hendry proved not the awesome choreography by Michelle Broussard, but rather how it treated the whole subject. I have a friend baffled by the popularity of superheroes, viewing the whole trend as an example of our nation's immaturity. Not sure I disagree, although seems to be the best of the genre often involves an attempt to move forward into maturity. Is not this one of the functions of myth? 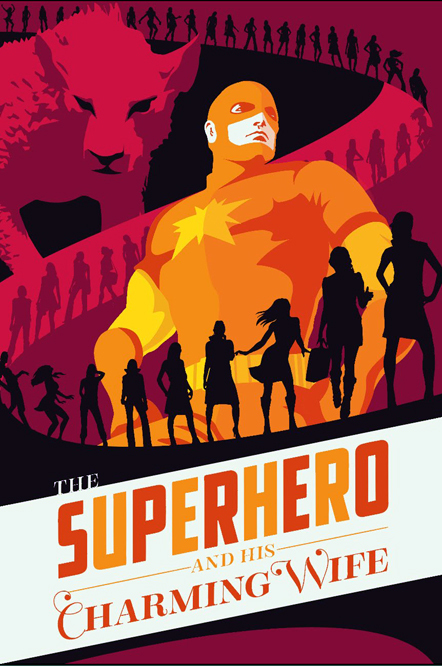 The Superhero and His Charming Wife sends our central character on a Hero's Journey with all the mind-blowing wonder of the best mythic quests from The Mahabarata to the Popal-Vu. Hero has great strength, but needs understanding--making him Samson, Heracles, Thor and a dozen others. But of course in a modern age he seeks not a Golden Fleece nor a Holy Grail. Rather, as a certain Demon (Paul Turbiak) explains to us at the very start, his question will lead him to a box, at the heart of that most modern of paradoxes, involving a feline described by Shroedinger. Like all myth, everything managed both strangeness and familiarity. 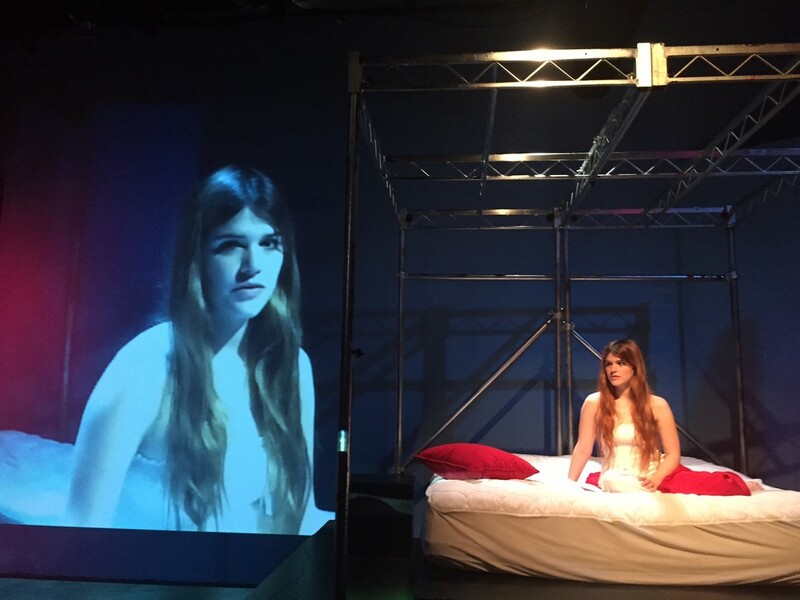 The Master Criminal (Alina Bolshakova-Roldan) whom Hero does not at first recognize (blind as Oedipus in his way). The Dark Creeper (Anne-Marie Davidson). Even his wife Julie (Laura Covelli) who seems different somehow. Seems is right. Perhaps he sees her as she truly is for the first time. Ultimately the Quest must be one for identity, which by its very nature terrifies, especially in modern times. We lack so many of the rituals with which to give us that--so a Waiter (Zahary Reeve Davidson) wants to become a superhero and tells a Waitress (Sydney Mason) to get out lest a job devour her hopes. With then is Julie (Courtney Munch) in terror of what she's lost and pretending so hard she's forgotten she was doing it. 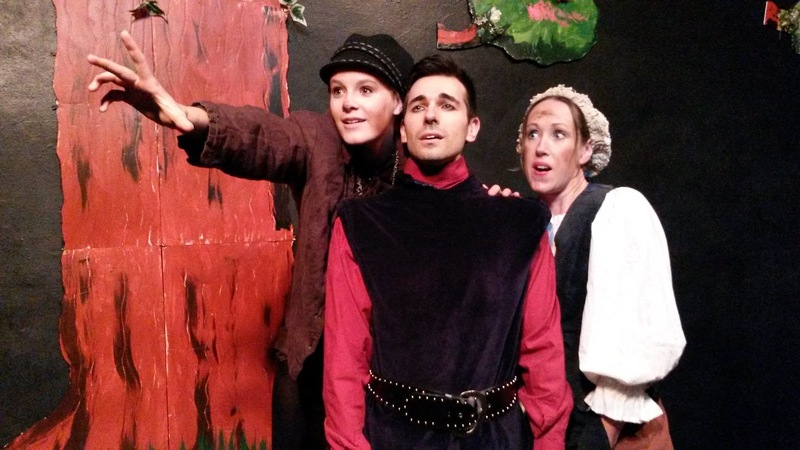 Does the Witch (Jessica Carlsen) know the way? Does she know how to find what others are seeking? Maybe. Or maybe she only sees part of the answer and it has driven her mad. But why? Because it was not her answer perhaps? We define ourselves by our jobs, but our enemies, by our loved ones, by what others perceive about us. Hero in this play finds himself forced past all of that. How horrifying! How glorious! But in the end his strength of body proves secondary, at best. Sublime but not particularly useful at the quest's final moment. Just as physical courage helped him arrive, but will not serve when confronted by the Box. Let us say I'm not surprised Hendry based his play on a dream. And for the record, I hope NMA (Not Man Apart) Physical Theatre Ensemble mounts this amazing work once more. Interesting, how in such a theatre-heavy burg as this one (400+ theatres and counting) certain patterns start popping up. Last Halloween the sheer number of vampire plays startled me! Right now I'm starting to see a fair number of works based on Greek myth. In this case, the Griot Theatre dove into the great epic of the Trojan War which to them was rather like the Bible plus Star Wars. 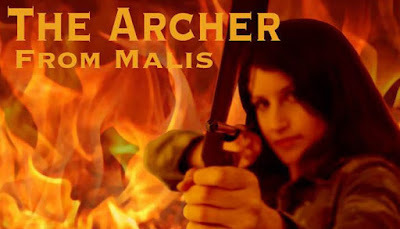 The title character of The Archer of Malis (adapted & directed by Malik B. Al amin) is Philoctetes, friend to the great hero Hercules and inheritor of his great bow (think Excalibur and you've got the right idea). Without going into too many details, Philoctetes for reasons of convenience was marooned on an island en route to Troy, by the order of Odyssea (made into a Queen for this version, one of many non-traditional points of casting, to great effect). After a full decade, the betrayers of our hero have returned, warned by an oracle only Philoctetes and his bow can conquer might Troy, thus ending the war. Herein we get into what fascinated me most about this play, even more than the uniformly fine performances. Although we often portray Ancient Greece from Disney cartoons to sfx-laden films to cult t.v. shows, we nearly always get it wrong. Very wrong. Because our world view is so in variance from theirs on so many levels! We see the Trojan War as a huge stupidity that cost oceans of blood for no good reason. But the Athenians who watched the ancient tragedy of Philoctetes saw that war as justified. War was glorious! Pride was to be avenged! Nothing shows this more than two details. For one, the central character as we see it is not the wounded betrayed warrior who rails against pitiless fate--against whom he has no ultimate defense--but rather Achilles' child Neoptolemus. This individual has chosen to help Odyssea trick Philoctetes out of his bow. Neoptolemus feels wracked by guilt and the play focuses on their decisions rather than the ostensible "hero." Second, whereas in the original Hercules is a deus ex machina, this play places both he and Zeus (his mother in this version) on stage, commenting and effected by events. That a god intervenes to prevent the worst of tragedies, and does so at peril, alters the feeling of the play profoundly. It feels more in tune with the modern, yet harkens back to why Sophocles' version remains an inspiration as well as actively performed piece over two thousand years after it premiere! Affionados of ZJU in North Hollywood make up a group well aware of that company's perennial performance art piece about death and horror. 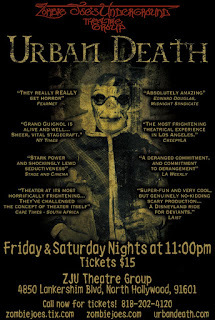 Urban Death is always strange, disturbing, funny (if your sense of humor tends toward the dark) and in some sense moving. But every single iteration remains itself, exploring subtly distinct aspects of death and fear and obsession. Every time, new vignettes make their appearance while old favorites often end up re-invented with some kind of twist. Previous performers arrive or leave. Fresh meat...er, faces make their debuts. What to say about Urban Death 2016? First, I would compare it to last year's edition. I can still recall my genuine shock at some of the scenes witnessed at that time, but also my feeling the shock (and yeah, at times the nausea) seemed invoked for its own sake more than anything else. Okay, that is fair and appropriate. This time, I would say the show proved less shocking and more unnerving. My eyes did not turn away so much as they stared with a kind of horrified fascination. Second, I will note a fair number of new cast members this year. Singling out individuals seems slightly out of sync with the whole idea of this ensemble piece, but also because a lot of the time I've zero idea who is on stage (unless a very specific body type stands out). But many faces I did see were new, and seemed very much to dive into the whole macabre atmosphere this piece builds upon. I want to touch on an interesting difference this year--a matter of focus. In the last few versions, many of the shocks came from our reaction to a scene that appeared shocking or gross. This time the horrors carried with them the idea of a character being trapped in some kind of personal Hell. For the record, methinks this is somewhat more "classical" in tone. Along those lines, I will also say the whole show this year included the return of certain set pieces, with many new faces and as such feeling fresh again. Some of these haven't been staged in two or three years, while new bits have been added to fit into that whole "Personal Hell" theme I picked up upon. More, this year's images and scenes don't features so many "ends" as UB sometimes dwells upon. Relatively fewer deaths for example, one way or another, but lots of situations in which someone clearly is (and feels) totally trapped and without hope. Yeah, we get the voices in the dark and a shocking apparition here and there (some of them with all the subtle nastiness of an abcess in your mind) but this year the climax of individual terrors seems to rest of some realization. Usually. Not always. The last thing Urban Death strives to be is predictable. Hence part of its very real power. 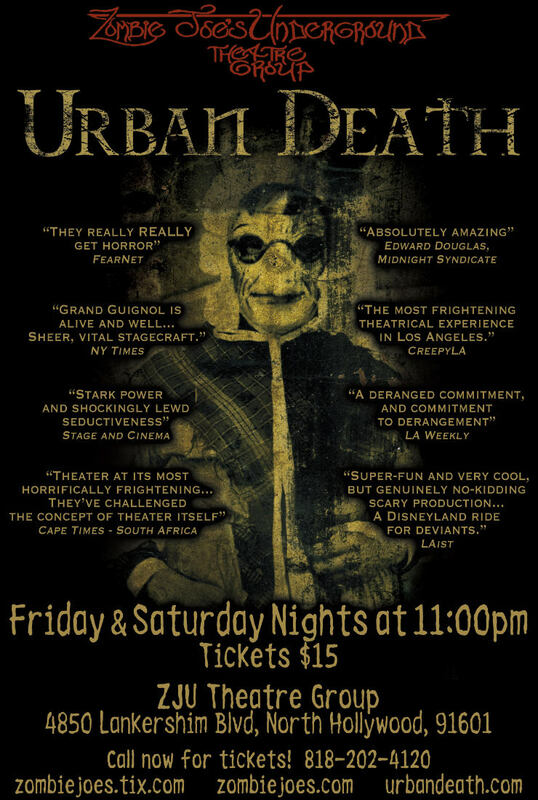 Urban Death runs Fridays and Saturdays at 11pm through May 28, 2016 (unless there is an extension) at ZJU 4850 Lankershim Blvd, North Hollywood (just south of the NoHo sign) CA 91601. Okay that warning is a little bit of a lie. I'm going to spoil the show Lunatics & Actors as little as possible while writing this review. My hope remains strong that audience members -- and this show deserves a great many such -- will come fresh to the experience and have their minds blown. 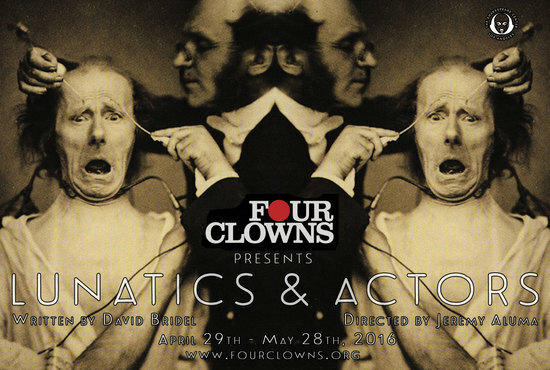 Honestly, I've never seen a single show from 4 Clowns I did not enjoy immensely, this one certainly not an exception. More, no two of shows presented have resembled each other in the least, yet remained clearly the result of a similar point of view -- an exploration of the human condition eyes open to the pettiness and horror one may find therein, yet willing to laugh, to find hope, to ask questions rather than present answers, and forever to entertain while sharing all of the above. With luck, this comes across as the praise it is intended to be! Stepping into the theatre to see this performance, one has a vivid yet not-easily-identified sense of place and time. That odd disconnect nine times out of ten emerges from imprecision. Here, one of those tenth times, it proves the exact opposite. But even now I cannot tell precisely where we were, except itself. Very much itself! Perhaps a dream, or an ersatz laboratory from another age, a steampunk asylum found in some alternate timeline. All of the above and neither? Almost immediately we meet a Dr. Duchene (Thaddeus Shafer) who purports to have learned the mechanism of the human mind and emotion. Smiling in his antique garb and somehow fiercely precise way, the good (?) Doctor promises a demonstration. Very soon we meet his assistants for the evening: Bon Bon (Tyler Bremer), Fifi (Alexis Jones) and Pepe (Andrew Aldredge). Assistants they prove, since they do in fact assist him, but one might well presume the three might also deserve the title "patients." Might. Probably do. Then again I'm not completely sure Dr. Duchene is really a doctor. Of his passion for this, his work, however we can have no doubt. Just as the truth of the emotions explored in the demonstration likewise leave little room for doubt. Ironic that--since every person on stage is an actor, which brings up the title. What after all is a Lunatic, really? What for that matter is an Actor? Is there a difference? Should there be? Who decides? 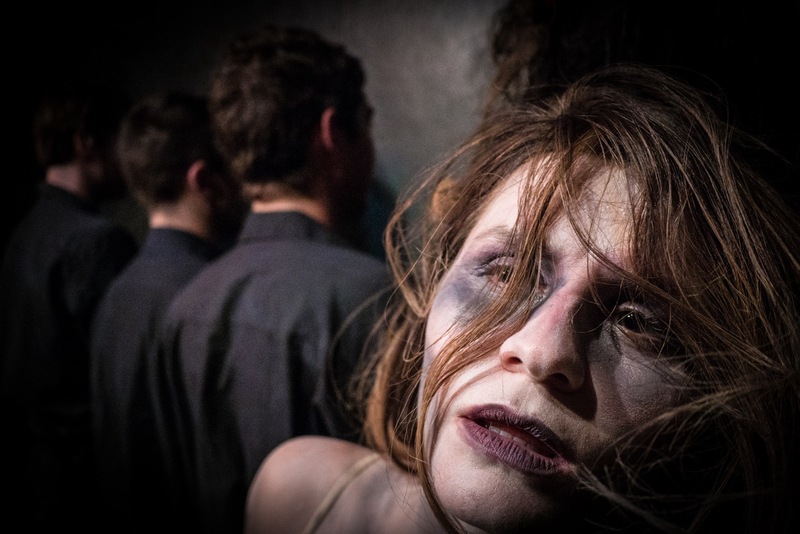 Again, I don't want to spoil the performance, but I can promise a intriguing odyssey on many levels -- some emotional, others artistic (along with one of the most interesting performances of Hamlet you're ever likely to see) and many philosophical. Philosophy such as metaphysics, as well as epistemology, and yes, ethics. All of it startling, sometimes chilling, very often funny, frequently disturbing and for nearly every single second compelling. 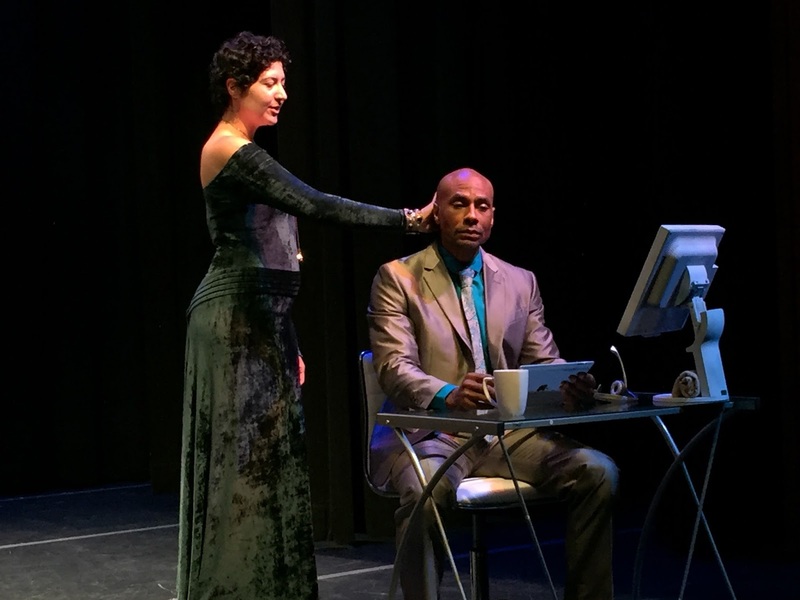 Lunatics and Actors by David Bridel, directed by Jeremy Aluma, plays Thursdays, Fridays and Saturdays at 8pm through May 28, 2016 at the Shakespeare Center of Los Angeles, 1238 W. 1st Street, Los Angeles, CA 90026.